Revolution Foods. My first thought when I heard the name of this new café in Newtown was that it is a fantastic descriptor of the menu. What is more revolutionary than veganism and the plant-based foods that form a part of it? I visited on Wednesday with the V Stars Sydney group where a special menu had been prepared for us by the vibrant owner Brandy. In addition to the main menu, we could order from a choice of shepherd’s pie, calamari and a burger. The café is located in the shop that was vacated by Spoon’s Vegetarian earlier this year. 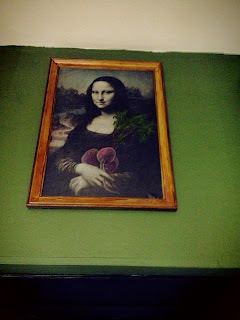 It has been redecorated with the whimsical touch of classical paintings ‘enhanced’ with vegetables. Here is the Mona Lisa with beetroot! Choosing just one dish from the all-vegan menu was a tough choice. The menu includes smoothies, sandwiches, nachos, bruschetta and fantastic thick-cut chips. I was very keen to try the shepherd’s pie as it is the quintessential winter dish, but I was very curious as to what the calamari was like as I had never tasted any vegan versions before. Curiosity won me over, and I tried the calamari not just for myself but for my sister who was an avid seafood lover before she switched to a vegan diet. 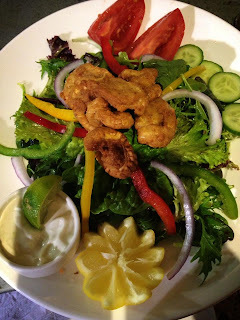 The calamari dish was loaded up with a garden salad and a serving of lime mayonnaise. I would have hope for a larger serving of the calamari as it did fall on the small side. While the calamari rings were small compared to the marine version, the texture and taste were very close to what I remember. The large caveat being that it has been over 15 years since I last tasted the marine version so my comparison is probably not the most reliable. Putting the comparison aside, it was a very tasty dish. There was a good range of cakes, slices and cupcakes for dessert baked by the local heroes Vegan’s Choice and Mad hatter cupcakery. 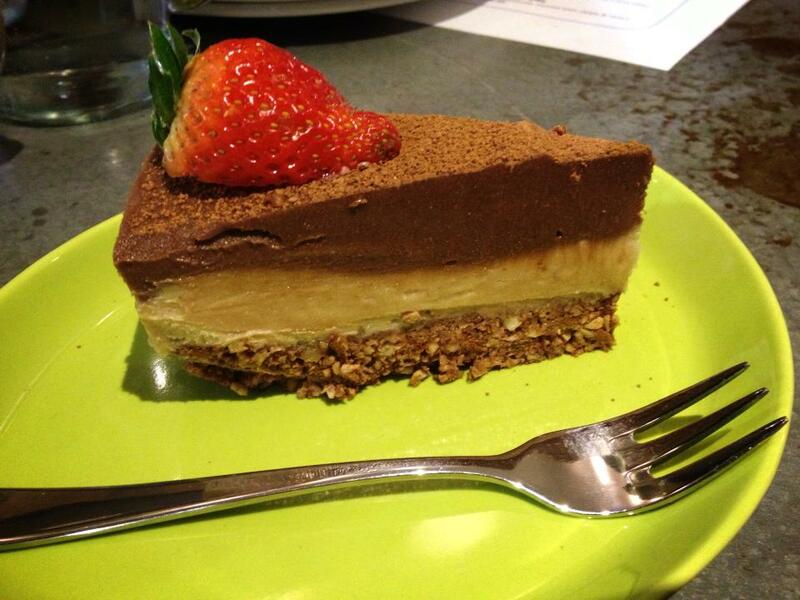 I chose a slice of the peanut butter and chocolate raw cheesecake. The flavour and texture were good but I would have preferred it to be a little sweeter. 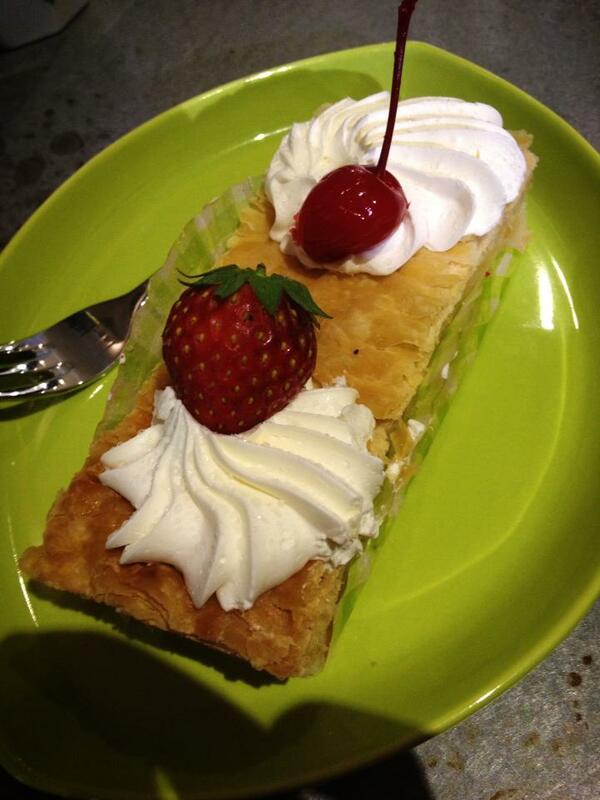 I have a big sweet tooth though, so it should be fine for those who prefer their sweets on the less sickly-sweet side. I didn’t try the vanilla slice but here is a picture of my neighbour’s serving. The slice received varying reactions from being better than the non-vegan version to being OK. A few agreed that it would have been better with the addition of passionfruit. Apart from the café menu, there is a small selection of vegan goodies available such as liquid smoke, some cheeses and seasonings. Overall, this café is a great addition to the already vibrant vegan scene of Newtown.